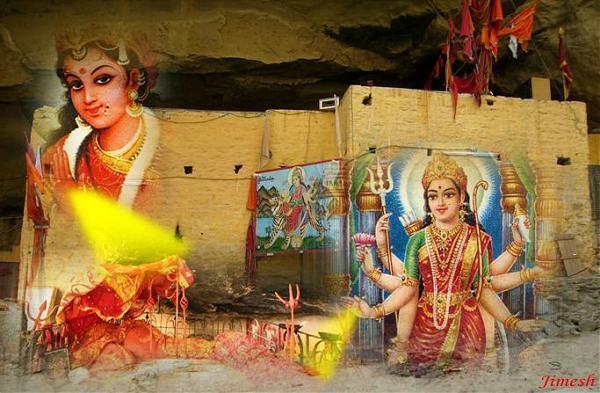 Hinglaj Mata Temple, located at 25°30’50″N 65°30’55″E, a holy place for Hindus, specially Brahamkshatriya (Khatri), Bhanushali (Bhansari, Bhansali), situated near three mud volcanoes eastward, the sight of geological interest. Hinglaj is one of the 68 teeraths of Hinduism. The following Seva Mandlis provide assistance to those intending a trip to Hinglaj. Also bring three pieces of coconut, a pack of incense sticks [agar battis], ghee and one piece of angoochha. Yatrees are advised to mentally prepare themselves for travel under strenuous conditions. Bus service for the yatrees is available at Bahawal Nagar, R.Y. Khan and Tando Allah Yar. However, each of these is limited to a given city/area and yatree must register with local police and should not go to other regions without having approved visa. For Indian citizens, as I understand, you should first get permission from the Indian government and then of Pakistan government. Also if you do get visa then it is restricted for certain days and certain areas and clearly not for all regions of Pakistan. For example, in this specific case of pilgrimage to Hinglaj, you would need to get a visa from the Pakistan High Commission in New Delhi or the nearest Pakistani consulate in your area for a visa allowing you specific stays in Karachi and Lyari district of Lasbela in Balochistan. You also have to register, as I further understand, at local police station once you arrive in Pakistan after the immigration and customs formalities. I was told that this is about the same process for a Pakistani citizen who intends to visit India. Being an American citizen I had zero problems in getting visa and without any restriction (now I understand why my Gurumata insisted to go to Hinglaj Mata Shrine directly from USA vs. coming to India first!). I pray to Hingula Devi to change this state of affairs. I urge you also to write to both governments to make the process smoother and open up the privilege to do this holy pilgrimage. The temple is about 250 km from Karachi. One can travel to Aghor River Bridge, on the Mekran Coastal Highway, by own car or by public transport (air-conditioned buses or van). Necessary information can be obtained from Mr. Veera Mal Dewani (0092-21-2624485), House No. 100 Swami Narain Temple Estate, M.A Jinnah Road, Karachi, Pakistan. From Aghore Bridge, the temple is about 15 km away connected by a metalled road. One can go by walking or hitch-hiking. The area is perfectly safe for a lone traveller. One can find some means of transport like motor bike from a nearby village, Aghor. But if someone starts on the road to Hinglaj, one can find some help in the village along the road. On the roadside, just before the Aghor Bridge, there is a café operated by a friendly owner, Jeeva. Talk for a while to him to obtain latest information and the best way to go there depending whether you are solo or with a party. To reach Aghor, buses are also available at Inter-City Bus Terminal, Yusuf Goth, Baldia Town, Karachi (9221-5413837-8, 0322-2319855, 0313-2266992). The fare is Rs.400 one way. One can go by van with the same fare. It leaves from Kalari, Shah Abdul Latif Bhaitai Road, Juma Mosque, Karachi, Pakistan. Really would like to visit Lahore, Karachi & Hinglaj. I don’t know, as an Indian citizen, whether it is safe or not. is it really need a pass port & visa for visit this Shakti peeth. Are they updating this regularly?